Colonel David Pendall is an active duty Army Colonel with extensive experience in Europe and within Defense Intelligence. He is a former G2, Senior Intelligence Officer, for the United States Army-Europe and also a former commander of the 66th Military Intelligence Brigade, also based in Europe. He has served as a J2 for NATO-ISAF forces in Eastern Afghanistan and as a senior staff officer in Afghanistan's ISAF Joint Command and the Muti-National Corps in Iraq. 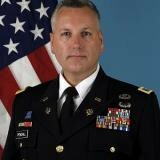 He has served over 28 years as a career intelligence officer and has served across all levels of the US Army, the Joint Force and in Defense Intelligence. He has Executive Education Certification from the Harvard Kennedy School of Government in National and International Security, served as a Fellow with the Massachusetts Institute of Technology (MIT) Security Studies Program and was assigned at MIT Lincoln Laboratory as the Senior US Army Liaison. He is also a member of the International Institute of Strategic Studies and the Royal Institute of International Affairs (Chatham House). Check out the incredible speaker line-up to see who will be joining Colonel Dave.